TH E M R EP O RT | 63 SECONDARY MARKET THE LATEST O R I G I NAT I O N S E R V I C I N G DATA G O V E R N M E N T S E C O N DA R Y M A R K E T The Fed's MBS Holdings and Housing There is one key difference between the impact of the Fed's MBS holdings and its Treasury securities holdings. T he economic impact of the Federal Reserve's mortgage-backed securi- ties (MBS) holdings are comparable to its Treasury securities holdings, except for one main difference. MBS, unlike Treasury securities, are subject to prepayment risk. For this reason, the Fed "can lower the amount of such risk that the market must hold, which could lower the cost of housing, favoring that sector of the economy," according to a post on the Federal Reserve Bank of New York's blog. Titled, "How Do the Fed's MBS Holdings Affect the Economy," the post said that in general, the Federal Reserve affects the economy by driv- ing certain behaviors through interest rates. "Higher interest rates motivate more saving and less borrowing and consumption today, while lower interest rates have the opposite effect," ex- plained Antoine Martin, an SVP of Research and Statistics, and Sam Schulhofer-Wohl, a Senior Economist and Research Advisor at the New York Fed. The authors pointed out that the housing sector is particularly susceptible to changes in interest rates, more so than much of the larger economy. "A cut in interest rates tends to shift the mix of ag- gregate spending toward housing, while a rise in rates tends to shift the mix of spending away from housing," they wrote. When it comes to MBS purchases, the impact overall is often to lower longer-term interest rates, especially when short-term rates are already low. "This impact is generally like the impact of holding longer-term Treasury securities," according to the blog post. However, the Fed did use MBS purchases specifically to support and stimulate the housing market after the housing crisis in 2008. Some may view the Fed's actions in the market negatively, perhaps as "distortions away from an efficient, 'laissez-faire' allocation," but Martin and Schulhofer-Wohl defended the Fed's post-crisis actions saying, "But cross-sectional effects are not always bad; if the market is already distorted by liquidity constraints, information asym- metries, and other frictions, then the cross-sectional effects of policy could help remedy those distortions and improve overall outcomes." MBS purchases offer a more direct stimulus to the housing market than the broader economy because of prepayment risk, the blog post explained. While investors, of course, "demand a risk premium" to compensate for prepayment risks, the Fed researchers explained that "when the Fed holds MBS, it removes some prepayment risk from the market, reducing the prepayment risk premium." In other words, mortgage rates, and thus the cost of owning a home, will go down. 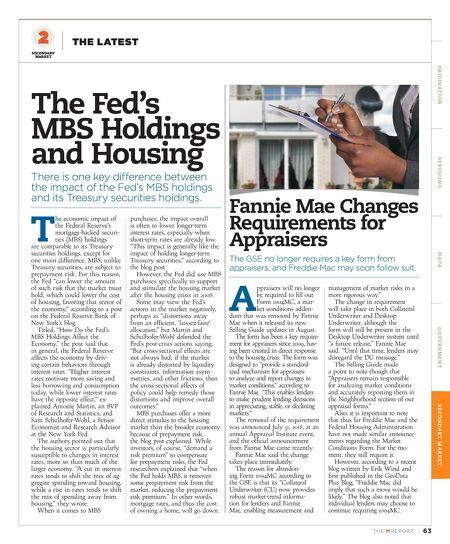 Fannie Mae Changes Requirements for Appraisers The GSE no longer requires a key form from appraisers, and Freddie Mac may soon follow suit. A ppraisers will no longer be required to fill out Form 1004MC, a mar- ket conditions adden- dum that was removed by Fannie Mae when it released its new Selling Guide updates in August. The form has been a key require- ment for appraisers since 2009, hav- ing been created in direct response to the housing crisis. The form was designed to "provide a standard- ized mechanism for appraisers to analyze and report changes in market conditions," according to Fannie Mae. "This enables lenders to make prudent lending decisions in appreciating, stable, or declining markets." The removal of the requirement was announced July 31, 2018, at an annual Appraisal Institute event, and the official announcement from Fannie Mae came recently. Fannie Mae said the change takes place immediately. The reason for abandon- ing Form 1004MC according to the GSE is that its "Collateral Underwriter (CU) now provides robust market-trend informa- tion for lenders and Fannie Mae, enabling measurement and management of market risks in a more rigorous way." The change in requirement will take place in both Collateral Underwriter and Desktop Underwriter, although the form will still be present in the Desktop Underwriter system until "a future release," Fannie Mae said. "Until that time, lenders may disregard the DU message." The Selling Guide made a point to note though that "Appraisers remain responsible for analyzing market conditions and accurately reporting them in the Neighborhood section of our appraisal forms." 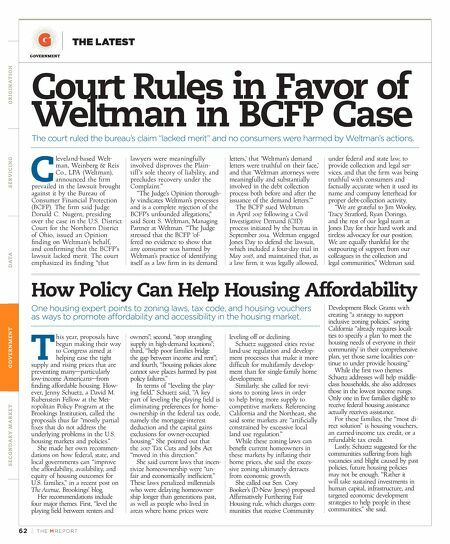 Also, it is important to note that thus far Freddie Mac and the Federal Housing Administration have not made similar announce- ments regarding the Market Conditions Form. For the mo- ment, they still require it. However, according to a recent blog written by Erik Wind and first published in the GeoData Plus Blog, "Freddie Mac did imply that such a move would be likely." The blog also noted that individual lenders may choose to continue requiring 1004MC.